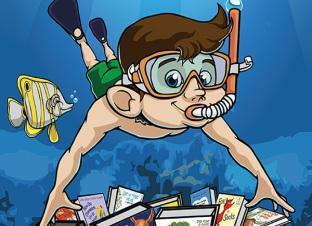 Dive into a book this Summer ! Don’t forget this Summer to keep reading for pleasure. We would like you to take photographs of your children ‘caught reading’ . Send the photographs into school in September and we will display them….and remember it doesn’t matter where, the more extreme the better! Below you will find useful websites to visit and places of interest where reading is promoted this Summer in Liverpool. Have fun! This year's Mythical Maze-themed Summer Reading Challenge has an extra special new dimension to it, a free augmented reality app for this year's Challenge. Compatible with both Android and iOS operating systems, the app can be used to scan the character stickers that children receive after each two books they read. Scanning the stickers will launch games and animations on a smart phone or tablet. The app also works with the Challenge's Mythical Hunt which libraries are running during the summer. Visit : http://www.thereader.org.uk to find out what’s going on at Calderstones Mansion. Join in with one of the reading events during July and August. The fabulous Sally Tonge tells tales for all the family. Laugh a minute, hilarious fun from the madcap poet from Yorkshire Craig Bradley. We will be launching the Peppa Pig Book Club here at Liverpool One at 10:30am and 12:30pm. Come and take a seat on our new Peppa Pig rug and enjoy a storytelling from new book, The Big Tale of Little Peppa or The Biggest Muddy Puddle in the World. Spaces are limited so pick up a free ticket or call the shop for further information.